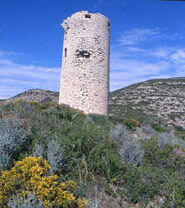 La Sierra de Irta is located at the northern end of the Valencia Region, between the municipalities of Alcalà de Xivert, Santa Magdalena de Pulpis and Peñíscola. With typically Mediterranean flora and fauna and scenery made up of steep cliffs which go down to the sea, this nature reserve is one of the most beautiful landscapes in the Valencia Region. The historical absence of important human settlements and the gradual abandonment of centuries-old farming and cattle exploitation, have permitted the presence of natural and ethnological values which turn this scenery into a privileged place on the Mediterranean.